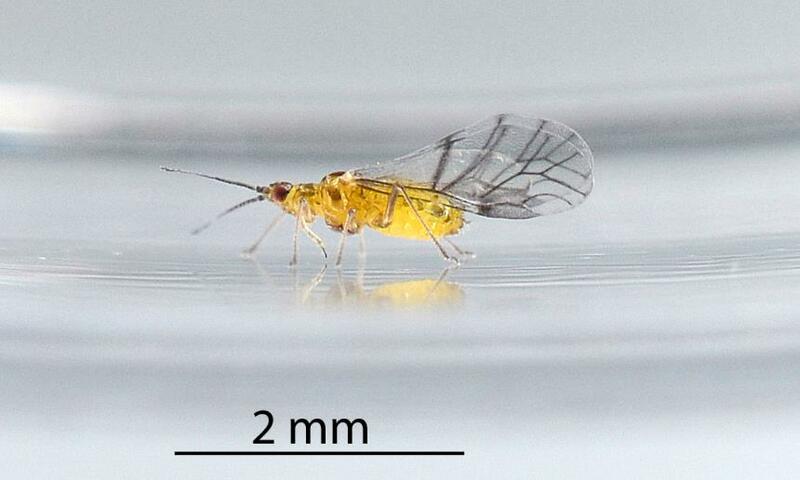 New Zealand beech aphid is in the subfamily Taiwanaphidinae. 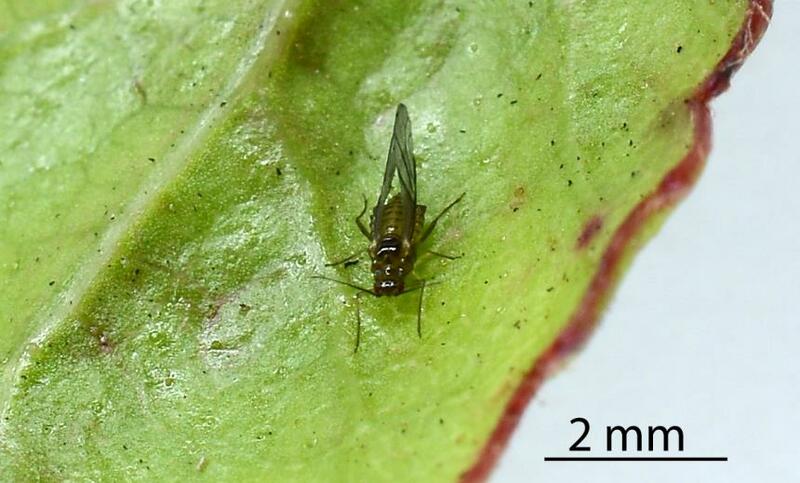 This subfamily contains three genera; Sensoriaphis species of that live on Nothofagaceae in New Zealand, Australia and New Guinea; Neuquenaphis that live on Nothofagaceae in South America; and Taiwanaphis that live on trees and shrubs, mainly Myrtaceae, in south-eastern Asia. 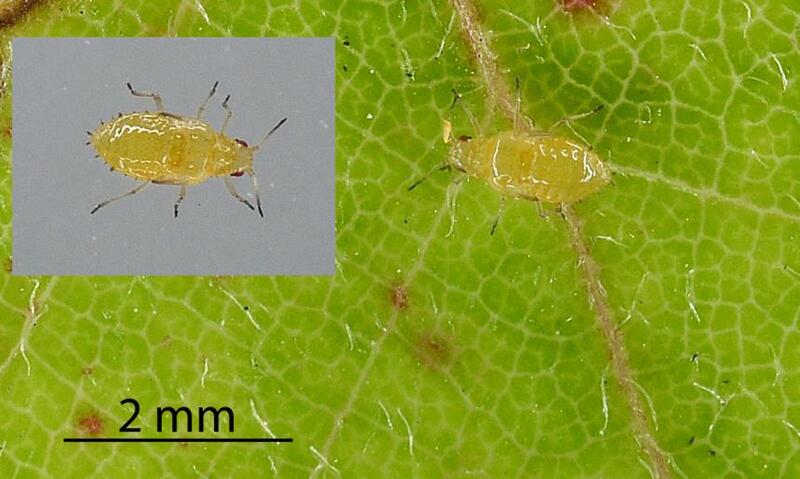 This endemic aphid is only found on Southern Beech trees in the genus Fuscospora. 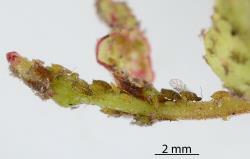 It was described and named from specimens collected in 1947 on Little Barrier Island, near Auckland. 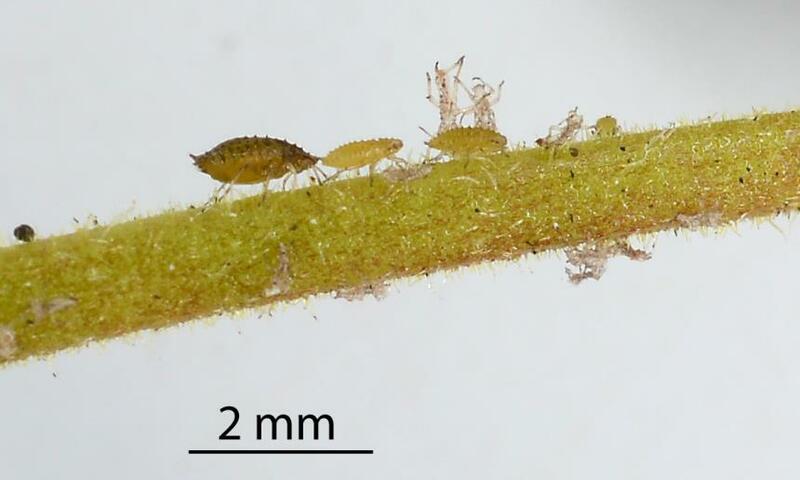 The aphid is found throughout New Zealand on its tree host plants in native forests and on isolated trees, even in Auckland city. Conservation status: Widespread on New Zealand beech trees in the genus Fuscospora in Native forest and isolated trees in Urban areas. 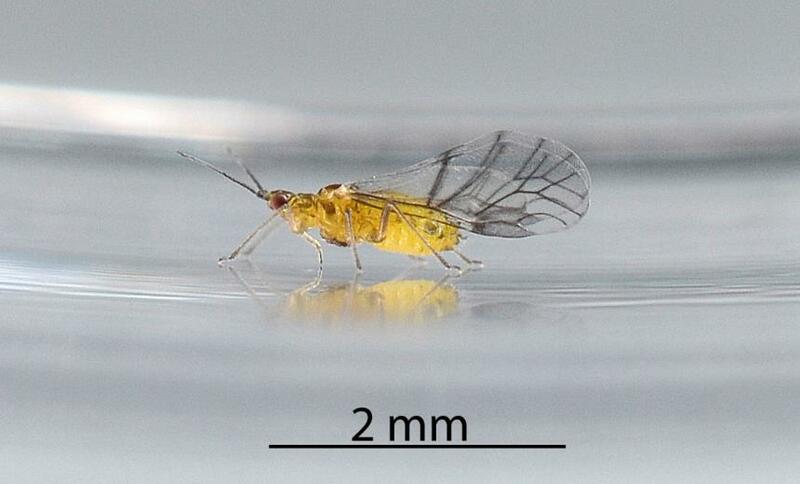 The New Zealand beech aphid lives on Southern Beech trees in the genus Fuscospora (Nothofagaceae) in New Zealand. 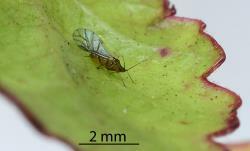 The aphid breeds on young growing shoots. 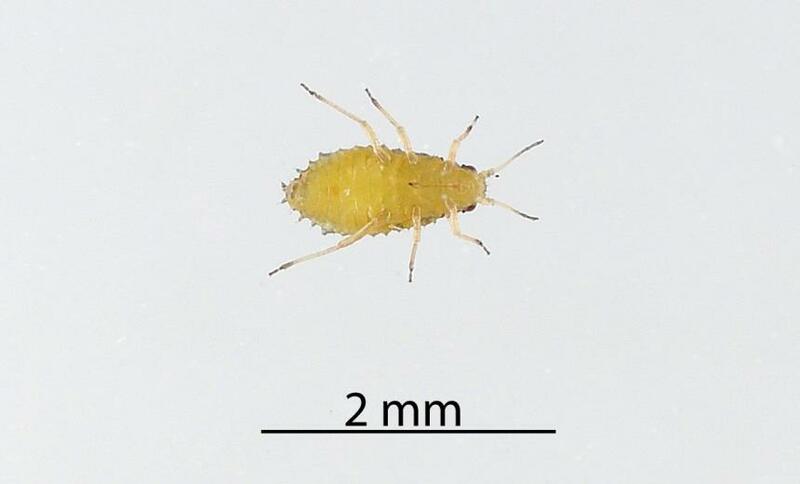 Like many other kinds of aphid, it has wingless and winged adult females that give live birth to nymphs, wingless females that lay eggs and winged males. However, no details are known about its annual cycle. Colonies can be found on young shoots in spring and early summer, and late summer and autumn if rain induces the growth of new shoots. The annual cycle described below is my best guess. It is most likely that New Zealand beech aphids overwinter as eggs and which hatch in the spring after bud burst and shoots have started growing. 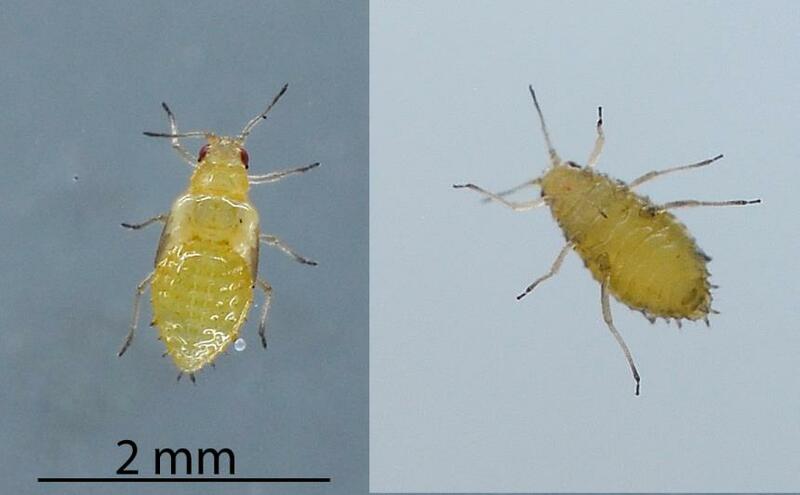 The first females are probably wingless (apterous) and give birth to live nymphs (viviparous). They produce young without being mated. This is called parthenogenesis. 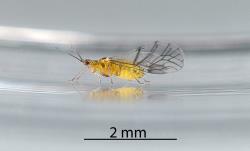 Later winged (alate) females are also produced. 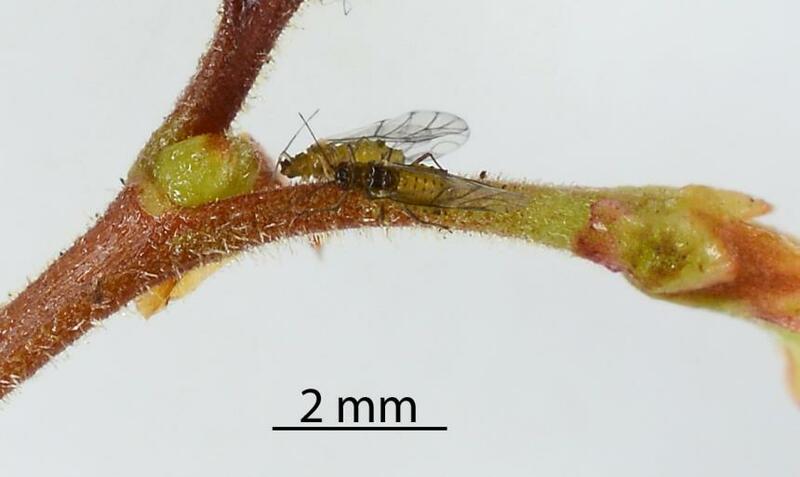 They are also viviparous and can fly to new shoots on the same tree or to other trees and establish new colonies. At some point egg laying (oviparous) females and winged males are produced. They mate and the female lays eggs, probably by new buds. 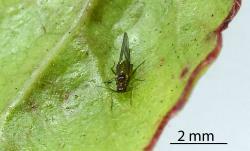 It is not known what triggers the production of males and egg laying females. The only egg laying females and males were found was in November. 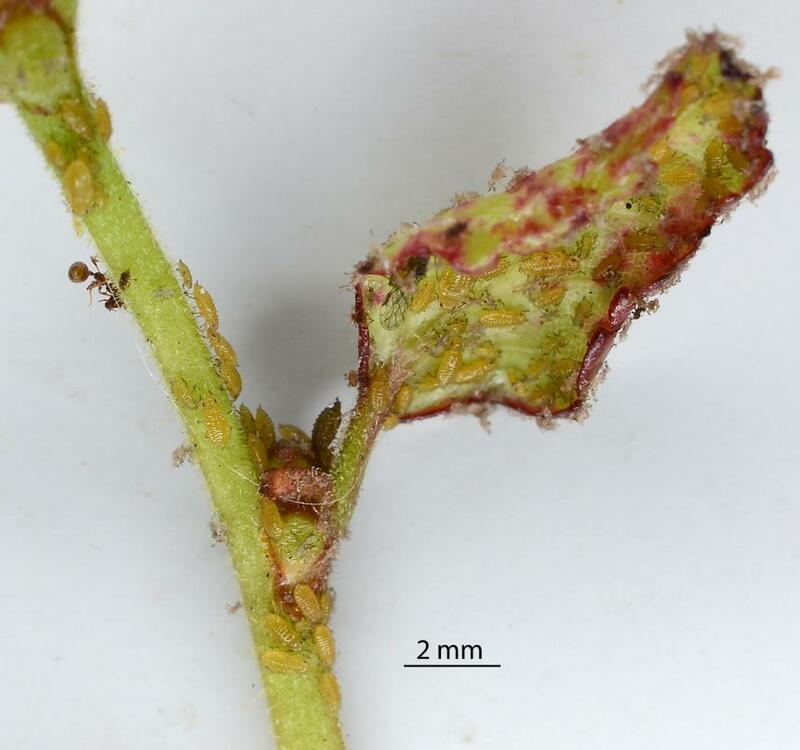 This indicates that the quality of the shoots on which the juvenile aphids are feeding is the trigger and eggs may be laid after the spring-early summer growth and any late summer. 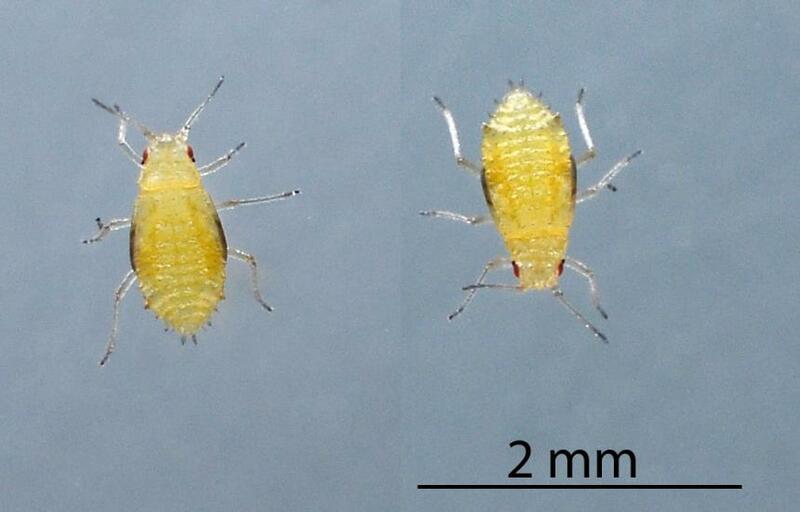 The adult New Zealand beech aphids are about 1.3 mm long. They are either winged or wingless. 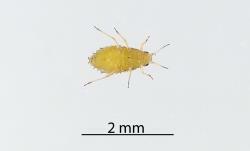 The abdomen of wingless females is yellow with dusky brown markings. The head and thorax (middles section of the body) are also dusky brown as are the three pairs of legs. The pair of antennae are dusky brown at the base and become dark brown at the tip. 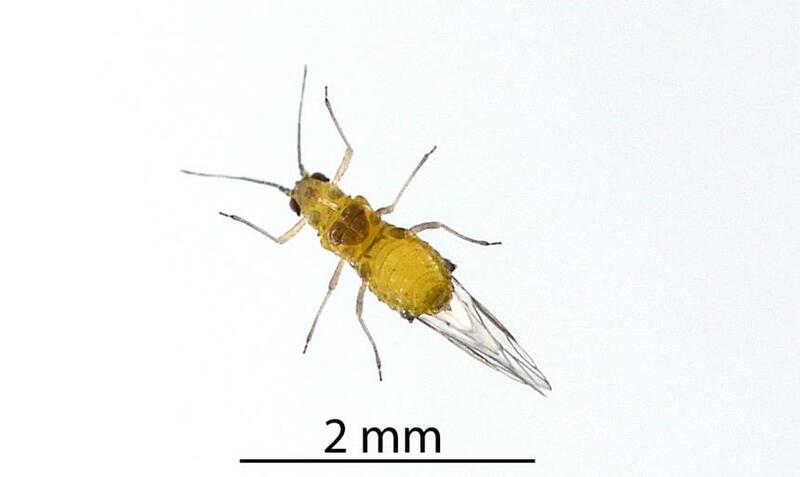 The winged female is similarly coloured, but the area of brown on the abdomen is smaller, and there are areas of darker brown/black on the thorax. The colouration of the winged male is not known. These aphids have two pairs of wings that are held vertically over their body when they are not flying. 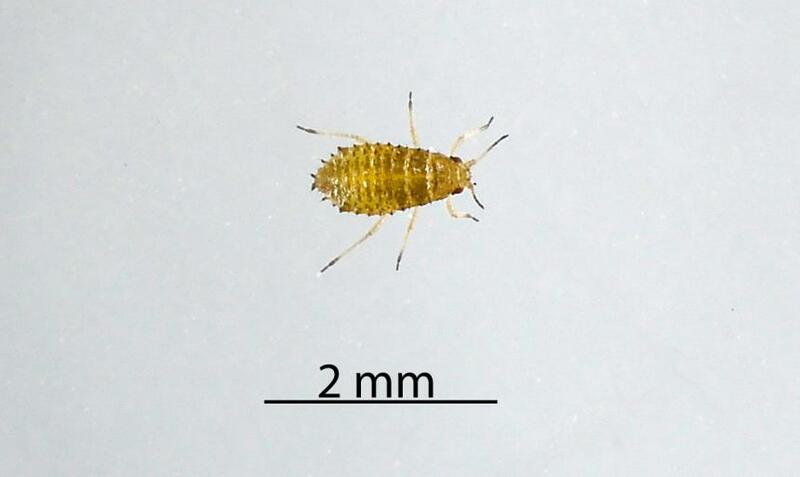 There is also a wingless female that mates with male and lays eggs. 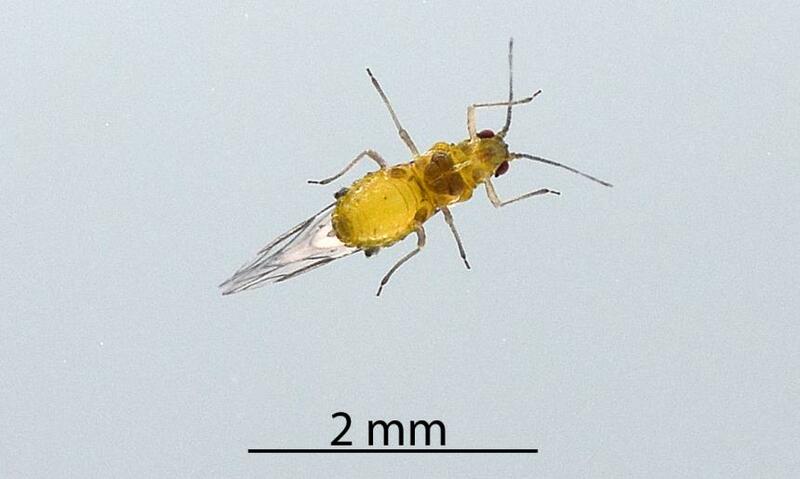 Its abdomen may be browner than the wingless female that give live birth. 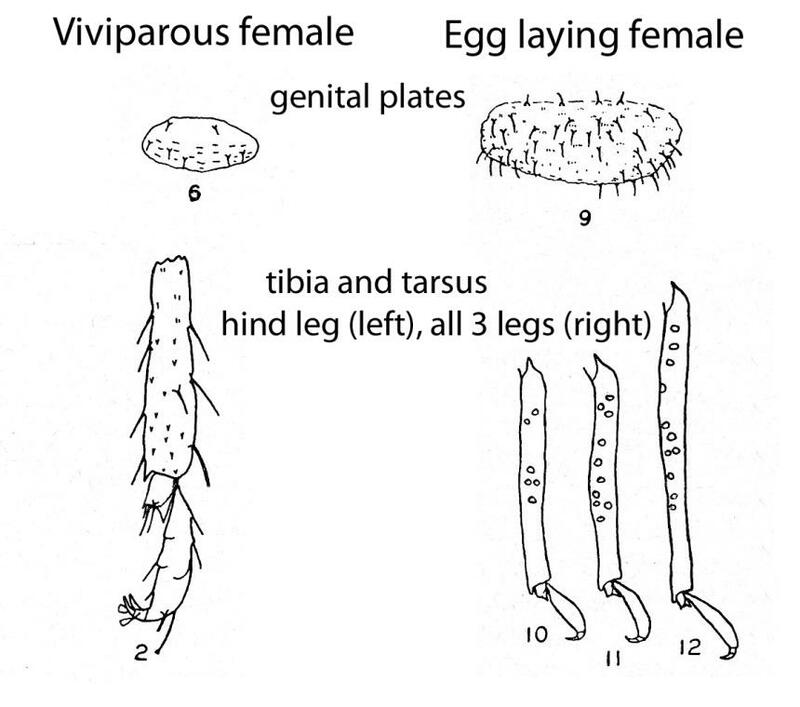 The most reliable ways to distinguish the two types of wingless females are the size of the genital plate (larger in the egg laying aphid) and the presence of scent glands, pale circular areas, pseudosensoria, on the hind tibia of the egg laying female. The underside of the head has a rostrum that holds the stylets used for feeding. 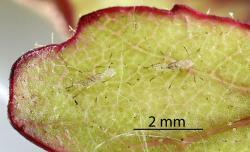 On the lateral margins of abdominal segment five are a pair of short cornicles though which honeydew is excreted. 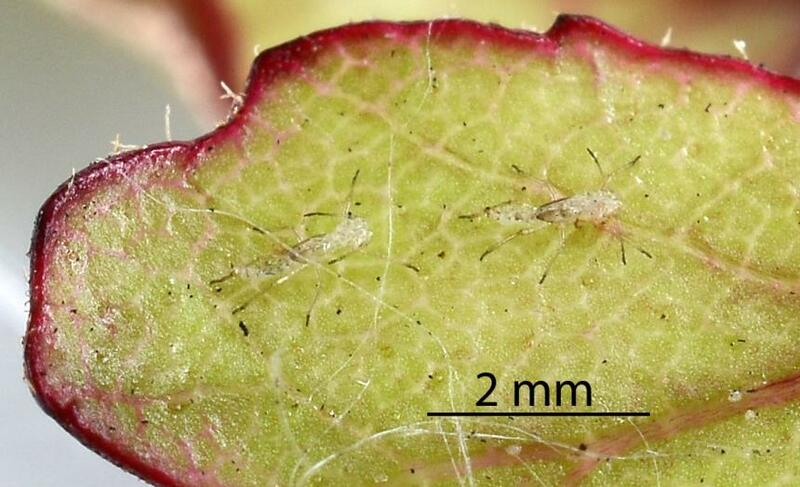 Two forms of females, wingless and winged, give birth to live nymphs, without the need for mating. The nymphs are yellow and like small wingless females. The number of nymphal instars (stages) is not known, but probably four. 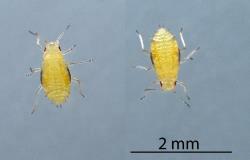 The growing nymph goes to the next instar by moulting, changing its skin. The dorsal (top) side of the skin splits and the next stage pulls itself out. 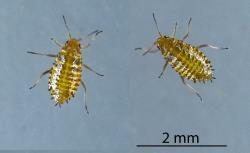 The fourth instar moults into the adult. 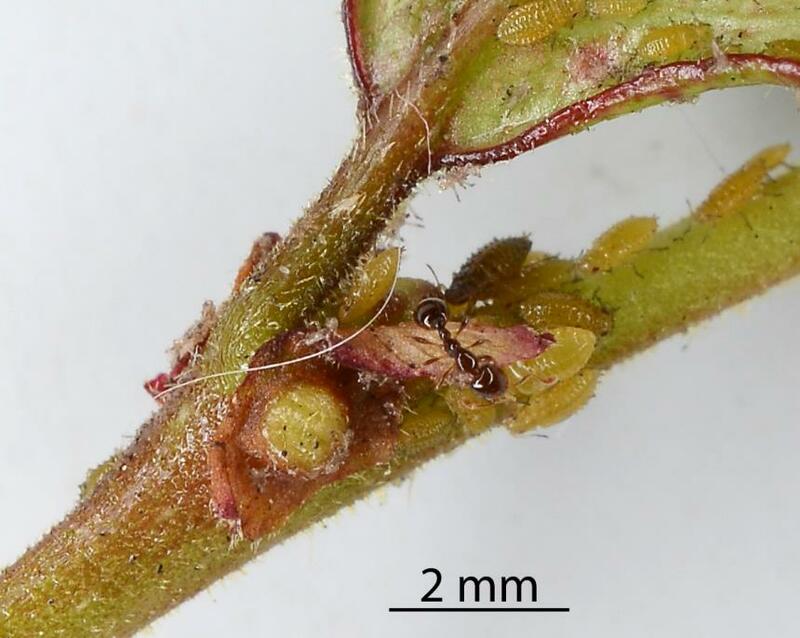 Fourth instar nymphs that will become winged adults, have wing buds. 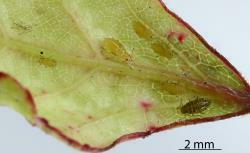 Like other Hemiptera, the New Zealand beech aphid has sucking mouth parts. The long stylets, special shaped rods, are held in the rostrum. 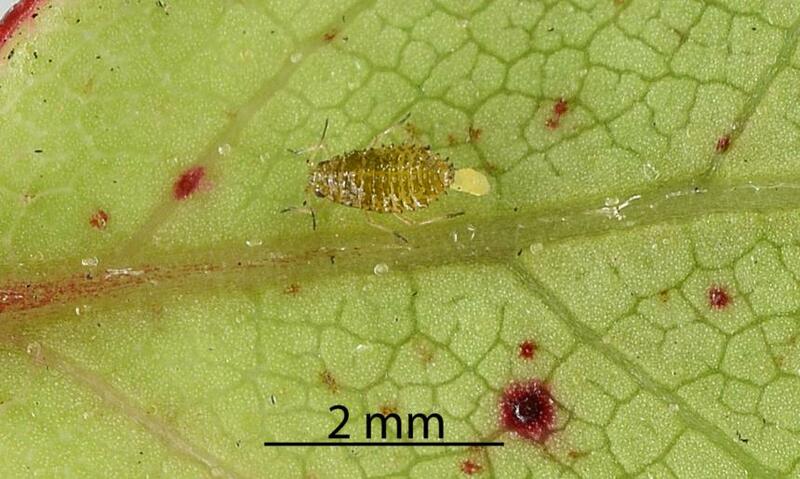 When it wishes to feed the aphid moves the tip of the rostrum to the surface of a leaf or stem. The stylets are then gradually pushed into the plant. The inner pair of stylets, form two tubes, one through which saliva is injected into the plant and a second through which plants juices are sucked up into the insect. The New Zealand beech aphid inserts its stylets into the phloem, the plant vessels for transmitting sap from the leaves to other parts of the plant. The sap has a high volume of water and sugars, more than the insect needs. It excretes the excess water and sugar, which is called honeydew. 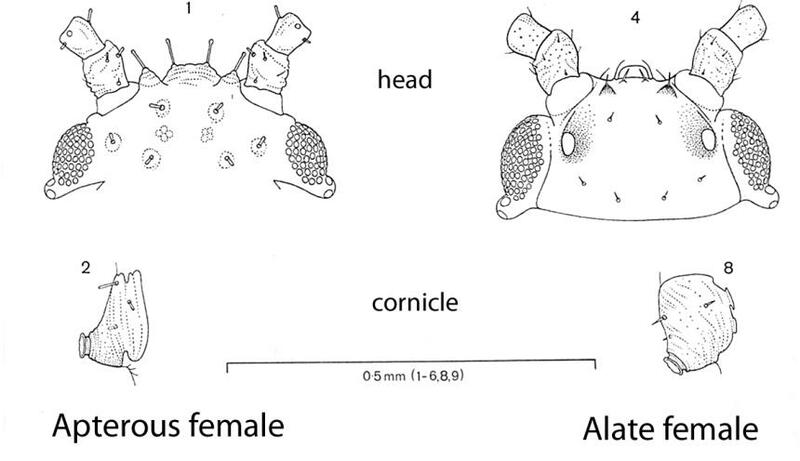 Drawings of the heads and cornicles of female New Zealand beech aphids, Sensoriaphis nothofagi (Hemiptera: Aphididae). 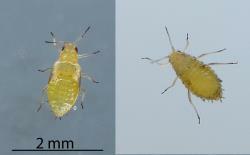 Both of these apterous (wingless) and alate (winged) females are viviparous (give live birth). Image: Nicholas A. Martin © Drawings modified from figures drawn by R.G. Sunde published in the New Zealand Journal of Zoology 1979. 6: 57-59. 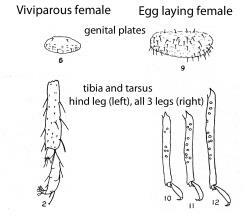 Drawings of the genital plates and tibia and tarsi of wingless female New Zealand beech aphids, Sensoriaphis nothofagi (Hemiptera: Aphididae). 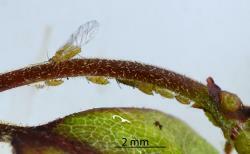 The viviparous female gives live birth to nymphs. 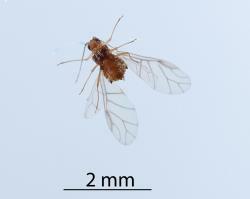 It has a smaller genital plate and lacks special scent glands on the hind tibia. Image: Nicholas A. Martin © Drawings modified from figures 29 & 30 drawn by W. Cottier in 1953 in Aphids of New Zealand published by the N.Z. Department of Scientific and Industrial Research Bulletin volume 106. The New Zealand beech aphid is the only species of aphid found on Southern Beech trees in the genus Fuscospora (Nothofagaceae) in New Zealand. Aphid colonies can be found on young shoots. 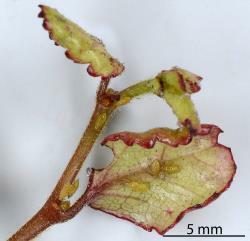 Large infestations can distort the young expanding leaves. 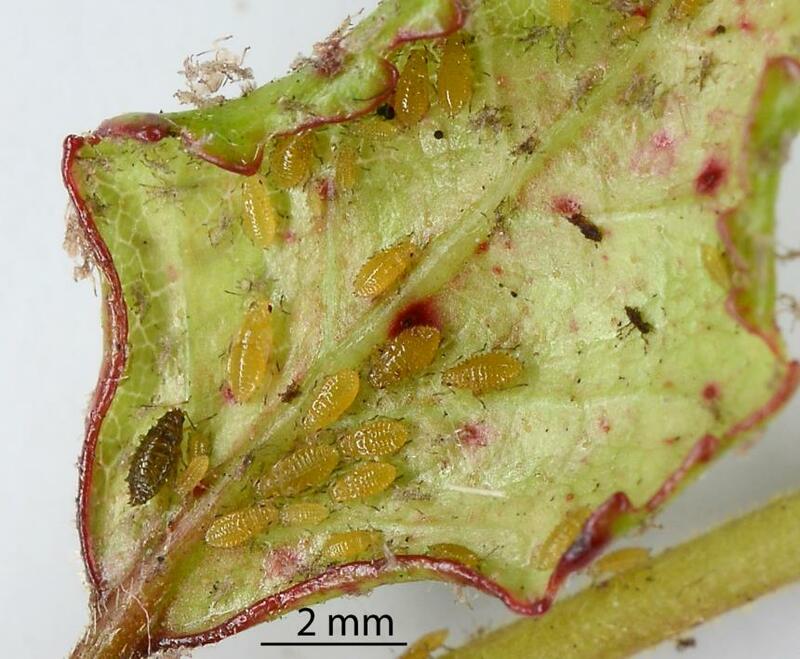 Most of a breeding colony will be green nymphs. 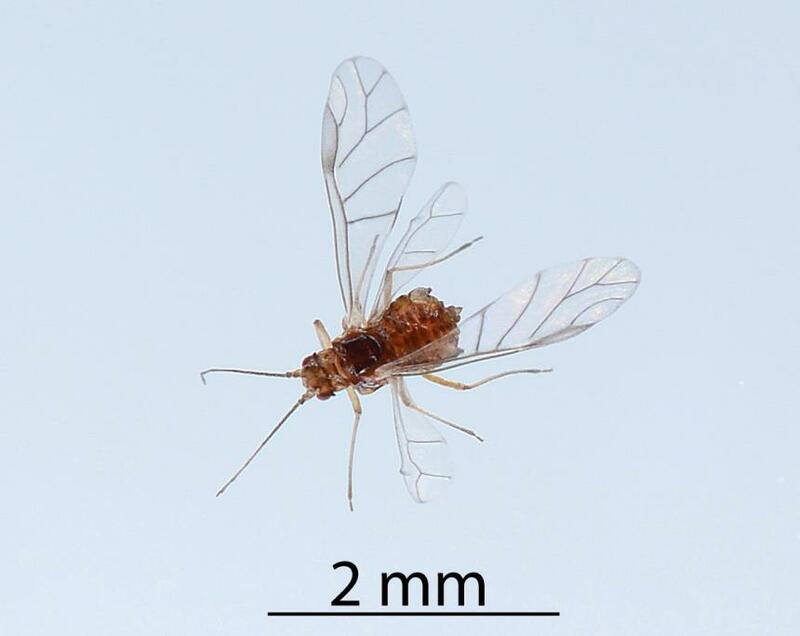 There may also be brown wingless females and winged adults. 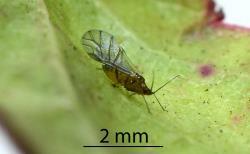 The only recorded natural enemies of the New Zealand beech aphid are two birds. It is likely that they are preyed upon by predatory insects and spiders. In Australia, a species of Sensoriaphis is parasitised by a species of wasp, Purephedrus relictus (Hymenoptera: Aphidiidae). Table: Predators of New Zealand beech aphid, Sensoriaphis nothofagi (Hemiptera: Aphididae), from Plant-SyNZ database (17 November 2017). The reliability index shows the quality of evidence for the host association (0-10, 10=high quality). 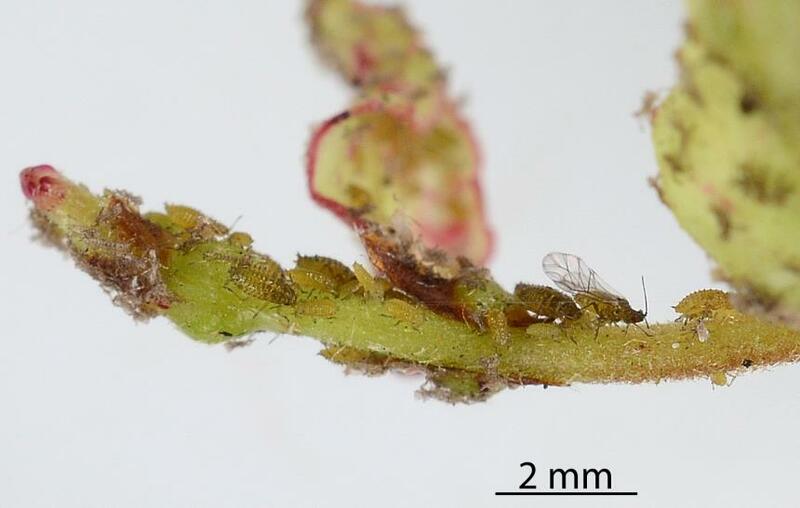 New Zealand beech aphids feed on three species of Southern beech (Nothofagaceae) trees in the genus Fuscospora. 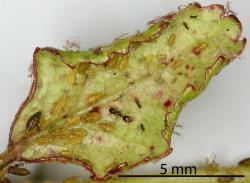 They may also feed on Black beech, Fuscospora solandri, but this has not been recorded. The aphids feed on the young expanding shoots and leaves. Table: Host plants of the New Zealand beech aphid, Sensoriaphis nothofagi (Hemiptera: Aphididae) from Plant-SyNZ database (17 November 2017). The reliability score shows the quality of evidence for the host association (1-10, 10=high). The New Zealand beech aphids feed by inserting thier stylets into the phloem, the plant vessels for transmitting sap from the leaves to other parts of the plant. The sap has a high volume of water and sugars, more than the insect needs. The excess water and sugar is excreted through the cornicles on the abdomen. This liquid is called honeydew. Ants have been seen feeding on honeydew produced by the New Zealand beech aphid. The aphid breeds on young growing shoots. 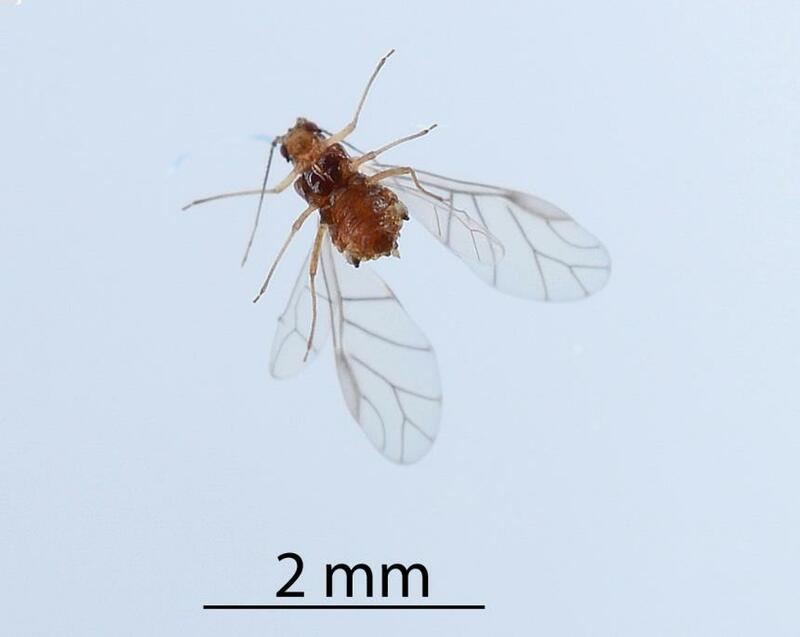 Like many other kinds of aphid, it has wingless and winged adult females that give live birth, wingless females that lay eggs and winged males. However, no details are known about its annual cycle. In particular, when the wingless egg laying females and the winged males are produced. Is it in response to the season (time of year) or the condition of the plant leaves and shoots on which they feed? Colonies can be found on young shoots in spring and early summer and later in the year following if rain induces more growth of shoots. 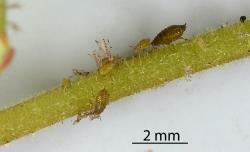 The aphids can be grown on caged pot plants. Macfarlane RP, Maddison PA, Andrew IG, Berry JA, Johns RPM, Hoare JB, and others. 2010. 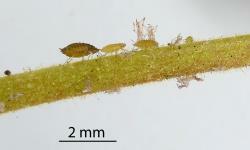 Phylum Arthropoda: Subphylum Hexapoda: Protura, springtails, Diplura, and insects. Pp. 233-467. In: Gordon DP (eds). New Zealand Inventory of Biodiversity. Volume two. Kingdom Animalia: Chaetognatha, Ecdysoza, Ichnofossils. Canterbury University Press, Christchurch, New Zealand (page 273). Stary P, Carver M. 2007. 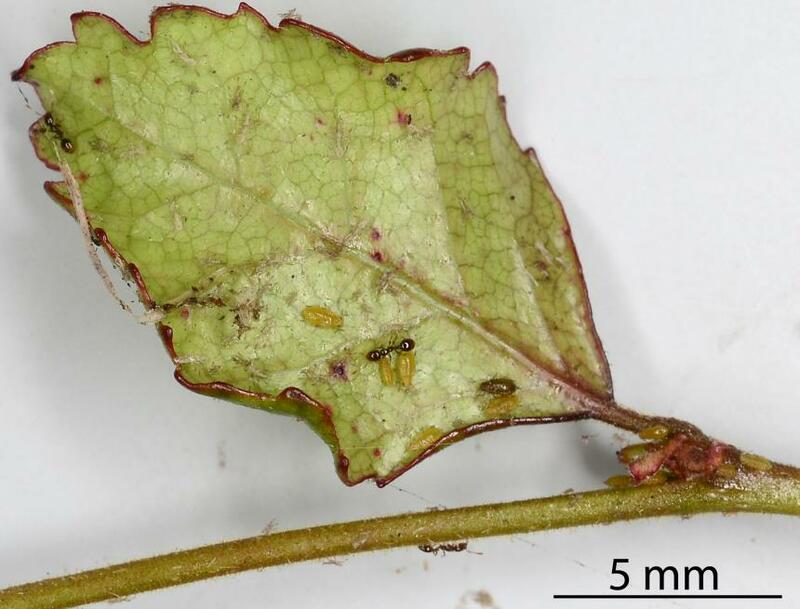 A new genus and species of Aphidiidae (Hymenoptera) parasitizing Sensoriaphis (Hemiptera) on Nothofagus in New South Wales. 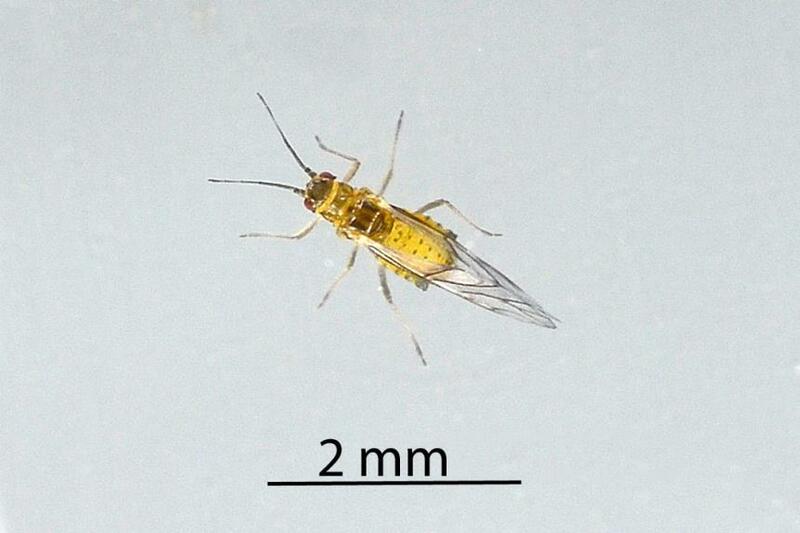 Australian Journal of Entomology 10 (3): 175-178. Sunde RG. 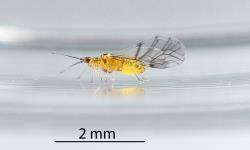 1979: New description of Sensoriaphis nothofagi: (Homoptera Aphididae). New Zealand Journal of Zoology: 6(1): 57-59. Martin NA. 2017. 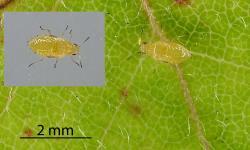 New Zealand beech aphid - Sensoriaphis nothofagi. Interesting Insects and other Invertebrates. 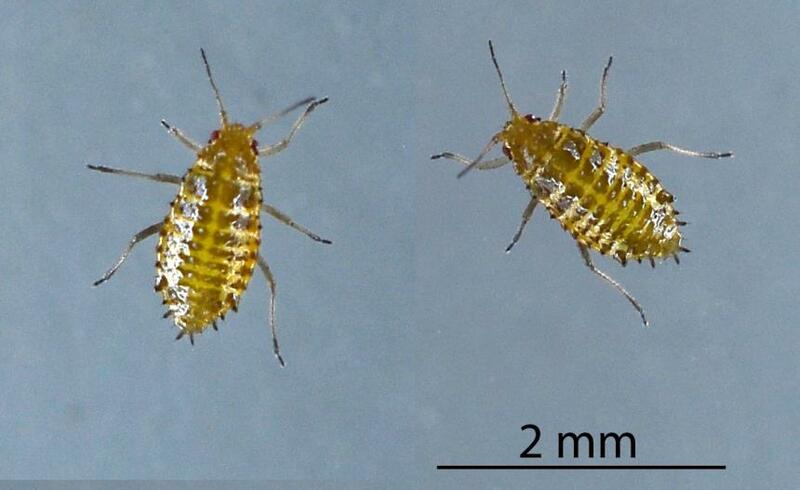 New Zealand Arthropod Factsheet Series Number 116. http://nzacfactsheets.landcareresearch.co.nz/Index.html. Date Accessed. ISSN 1179-643X.